SCHWING Stetter has develop a batching plant with an interesting price - performance ratio, and also which uses lesser space. It has produce the customer centric M30Z batching plant. The new M30Z Batching plant is designed from the ground at the company's Irungattukottai plant. It is equipped with a pan mixer and can produce a concrete output of 30 cu.m/hr. The concrete discharge height is 4 meters and can be operated at a voltage of 415 V. The Control Unit for this batching plant is MCI70 version 3.1. Besides this, the plant also does not require a ramp or conveyor to feed concrete into the bins. 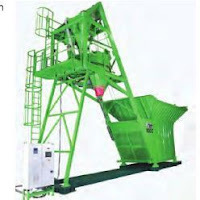 The total installation altogether requires batching plant + civilwork+conveyor+loader, and not to forget the power and water connection. The plant is delievered to the construction site on a semi trailer. Only a mobile crane is sufficient for the erection. It's easy to erect, dismantle and transport because it's a one unit on the whole. IN the innovative M30Z Batching Plant, no foundation is required. Aggregate feeding can be done without a ramp or feeding belt conveyor. The plant comes with a low feeding height and skid, also eliminating the need for a foundation.